I saw an elaborate Valentine on Pinterest today. I sighed with relief that I wouldn’t be making any of those. Then I stopped to wonder why that was my gut reaction. I guess it’s not rocket science. I always found it tedious doing those class valentines with my kids. When they were littler, they always lost interest after finishing about two! That meant I nagged them for a few weeks before I got stuck hastily writing and assembling the rest. The $*@% reading log that had to be signed every school night. The $*@% homework log or student planner that had to be signed every school night. Keeping an eye on my kids 24/7. I can send them out to play now and only mildly worry if I haven’t seen or heard them in a while. The book fair where money disappears into an abyss: no one ever buys books, just erasers and knick knacks! So there’s my list of things I won’t miss. As much as I’m relieved these minor inconveniences are over, I know their disappearance only makes way for new — dare I say it, scarier — things to appear. Things like driver’s ed. College applications. Wanting clothing that’s popular. Try-outs for varsity teams. Dating. Maybe making Valentines wasn’t so bad after all. Well, I’m still signing my 4th graders stuff but it’s like I see the end of the tunnel, knowing how little I have to sign for my 8th grader, and I’ve got my eyes on my eventual freedom!! Horros! I have to say I am kind of missing several of your “won’t misses.” Huh? Had you told me that 10 or even 5 years ago, I’d have suggested rehab. For both of us. 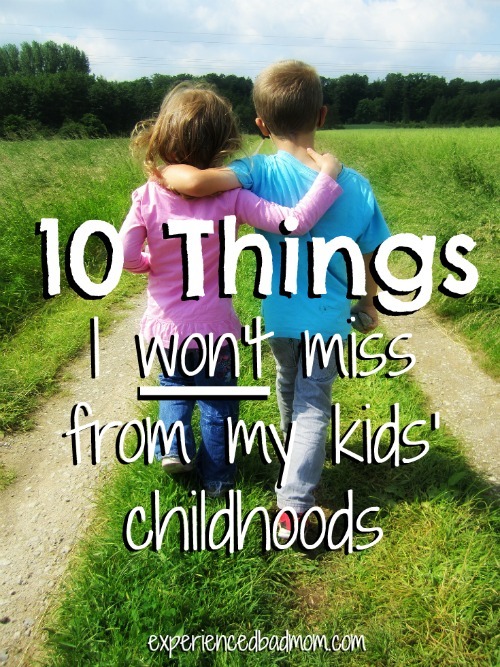 With my two now in their early 20’s, what do I miss the most? The chaotic situations I shared with other moms and some dads. Oh man. How we laughed over the endless silent auctions, hot lunch order forms and driving for field trips. Ok, maybe I don’t miss the Valentine efforts ( and my 4 year-old tumbling out of preschool covered in hives due to his huge consumption of red dye) but I do miss my fellow survivors and fun we didn’t realize we were having. That’s why I like hanging around you, Kelly. You’re so wise. Next time I’m whining about buying another t-shirt for field day or enduring christmas break reading logs, I’ll remember I’m in it with my fellow parents. I can already see missing them. We are in the thick of it? Read Kelly’s comment above if you have a moment. Helps me try and embrace the insanity a bit. Oh my word that pile of Valentine’s is a disaster. I especially get curious about the ones that have a tattoo no one will ever use that’s about the size of a pencil eraser. Amen to the list. I’d like to add no more playing tooth fairy in the middle of the night or letting Santa take credit for your awesome gifts. Not having to worry about what they’re flushing down the toilet. I could go on forever, lol. With that said, I still have to sign that stupid student planner every night. Of course, a day will come I’ll miss that planner. What is up with the planner? I think it makes us all helicopter moms and we aren’t supposed to be that, right? LOL not having to worry about what they’re flushing. So true!! This kind of makes me sad…and I have 5 years until I’m completely done with elementary school activities! I’m with you on signing all of the reading/homework/computer assignment logs – that ish gets forgotten half of the time anyway now. OR the keeping an eye on them 24/7…that business is for the birds! Kelly’s comment above made me pause and realize that I do need to focus on the fact that I have mom friends along with me for all of these annoyances. It kinda made me sad to think that when we’re all done with our kids in school we won’t have things like this to bond over. Better you than me for the fundraisers. I like the no-hassle kind in my son’s middle school where you just write a check at the beginning of the year. Oh my gooness, I totally forgot about the school Valentines! Why did you have to remind me of this today?? Enough time has passed since I was in the thick of this that the memories all seem happy and nostalgic. I still get misty-eyed every August when I see the school supply lists at Staples. Two of my favorite things: lists and school supplies. Perhaps I could hire myself out to overworked parents and take that “chore” off their list. Ok, you and Kelly (above) are in cahoots and doing a nice job of reminding me to savor the moment! I just bought the store bought Valentine’s and actually appreciated the fact that I no longer feel the need to create cutesy ones. We’re at the end of Valentine’s Day; to the point where they just want the candy and aren’t worried about the effort. That’s fine with me for now! Is it bad that I don’t really have my kid fill out her reading log? The teacher knows she reads…reading is actually one of the biggest things that gets her in trouble at school! The girl can pick up a book and finish it in a day. You’re making me look forward to when they grow up! Those all pretty much fall under the category of “things I don’t miss about public school!” They are minor annoyances that add up over time! Amen. Amen. Amen. I started a new blog hop at Stories Of Our Boys. It’s called the Hot Mess blog hop. I thought you might like it b/c you are funny and so relatable! Girl, you and me BOTH! 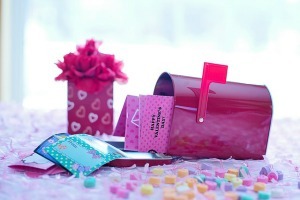 I have boxes of Valentines sitting on our table now… and I’m sure I’ll be helping my kid fold those suckers and stick that little prize inside. We’re up to 28 kids in his class now. Oh crap- I need to plan the class party! Thanks for reminding me with this post! Add that one to the list too. Planning and running class parties. LAST YEAR FOR IT ALL!!!!! !